Nikki 20th October 2016 20th October 2016 3 Comments on Lego Cake! However this cake that I made recently was definitely worth posting about. It was a birthday in my research group recently, and I was talking about what sort of cake to make and someone suggested that I should do a Lego cake… Now I have never really done much in the way of moulded cakes/icing work before beyond the normal piping work on cakes and decoration on a christmas cake, so this was definitely going to be something new. 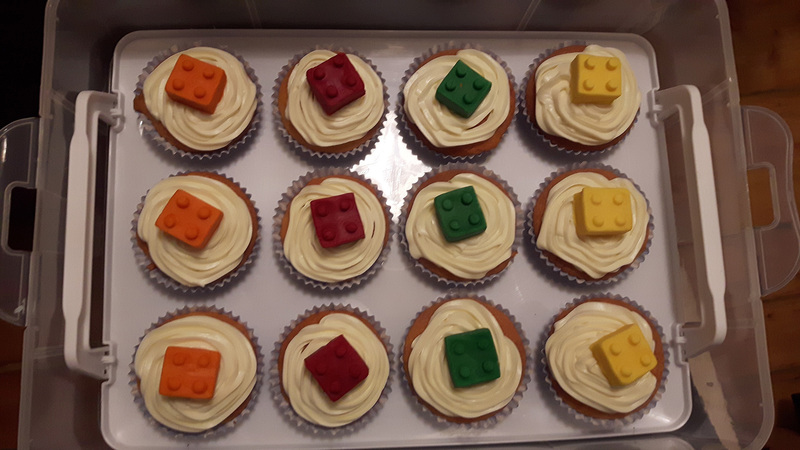 But we had been doing a project that involved the use of Lego so I thought a lego cake would be a pretty cool thing to do if I could pull it off. To start with I thought, “maybe i’ll just do some cupcakes with lego brick toppers”, so to amazon I go, and then I come across a whole variety of brick moulds, lego person moulds and even one that looks like it might be cake sized… So with a bit of encouragement from other people in my group I purchase the moulds and go in search of copious amounts of coloured modelling icing (another thing I have never really made from scratch). I decided to get started with a few lego block toppers and some were fairly successful, others not so much. I even got some coconut oil spray as I thought it would help release from the mould, but in general I didn’t really need it. But after a bit of work I had a batch of successful lego bricks in a variety of colours (I did do a few other blocks after this, but this was most of them). Some were made by making a 2×4 block and then cutting it in half, but most were just made in the 2×2 mould as even though I only had one of them, they tended to come out of that mould better. At least once I had done that the cake mix was sitting level in the mould, some my baking beads/cupcake moulds had done the trick to hold it up. I levelled out (mostly) the cake and then flipped it over ready for the icing! Time to get out the icing tools which I have rarely used, at least now when Pippa moans about them I have actually used them recently! 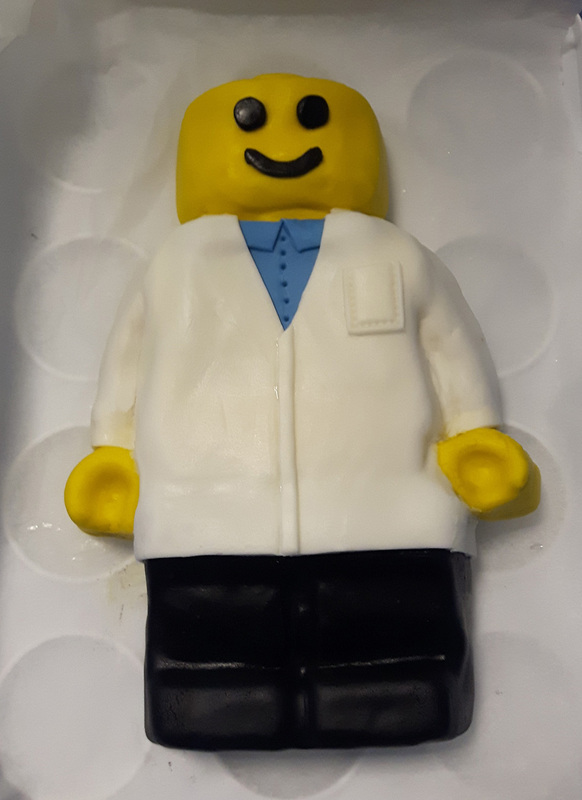 The head and hands of the lego man were iced in yellow, since we are a science office I wanted to try and do something sciencey so he is dressed in a lab coat. Under his lab coat I put a blue shirt though. The hands were done in a similar way to the head, moulding the yellow over the ‘hand’ and the wrist. You can also see the collar here and the detailing on the shirt buttons. Then it’s time for the trousers. Black naturally… These were moulded around the bottom of the hands so the hands appeared to be on top. The lab coat was applied in a few stages the first bit was to mould each arm on. The hardest bit was getting the wrists to look right wi. Then the lab coat was moulded around the shoulder and arms, and cut and moulded around the hands so they appear to be on top. The only thing remaining then was to add the detailing to his face. 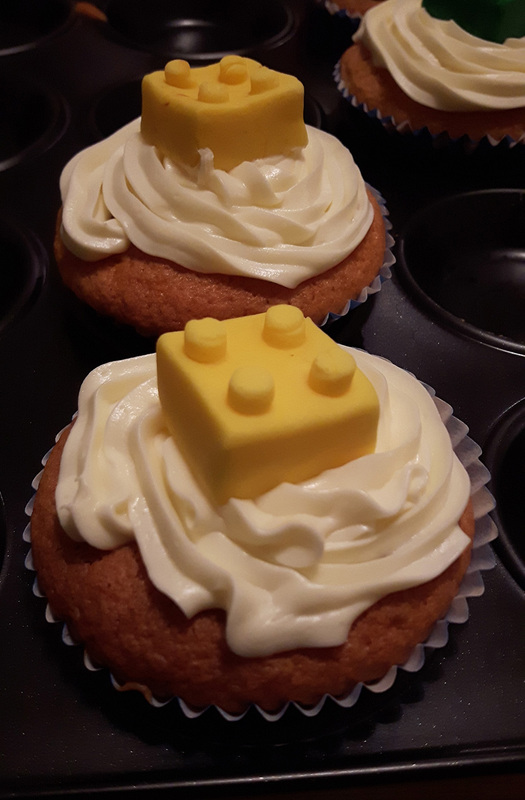 And then I made sure to make some blocky minions to accompany him in the form of cupcakes with the lego block toppers. (I did think afterwards that I should have made mini lego men for the cupcake toppers, but they were quite difficult to make nicely). We actually ended up only eating the cupcakes in the office as my supervisor took home Dr.Block so that he could show his children. I have yet to find out what they thought of it… but everyone else definitely appreciated it.